Protein deficiency is a terrible thing. You may have seen the effects in pictures of the bloated bellies of starving children. Ironically, in industrialized countries, more health problems are the result of an excess of protein in the diet. It has become well established that too much fat can be harmful to one's health, but many people still mistakenly believe that there's no such thing as too much protein. That can be a serious mistake. About 20% of our body is made up of proteins. Bones, skin, muscles, cartilage, all enzymes and some hormones are basically protein, in tens of thousands of complex chains of amino acids. Through a process known as protein turnover, our body breaks down proteins, recycling most amino acids. Some new amino acids must be added, and the proteins we eat are needed for nearly all our internal processes to continue. While plants and bacteria can manufacture all the necessary amino acids for their existence, humans can self-produce only thirteen. Those that are not required in the foods we eat, are called nonessential amino acids. Another nine amino acids that we need, the essential amino acids, must be supplied in the diet. 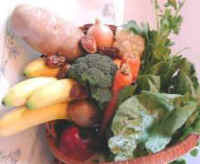 All these can be obtained directly from plant foods (or indirectly from animals which have eaten plant foods). Contrary to what is often believed, it is not necessary to eat meat, fish or fowl to have all the essential amino acids in a balanced supply. As the foods we eat are broken down into the various amino acids, the body's cells select what they need to make their building blocks. Since there are nine amino acids that cannot be made within the body, it is important to eat foods that supply these. Combinations of vegetables, grains and fruits supply these essential nine amino acids, even if eaten at different meals several hours apart. For optimum health and growth, adults need only 10% to 15% of their calories from protein. Meats, eggs and dairy products contain up to 40% protein but not all of it is available, due to difficulty in digesting them. Most vegetables and grains are reasonably low in protein, almost all of it available through digestion. Some beans (and a few vegetables) are as high in protein as meats, and when eaten with grains and vegetables, supply a healthful balance of complete protein, carbohydrates and fats. The standard American diet is too high in animal proteins, leading to loss of calcium in the body. This can result in osteoporosis, a condition that makes bones brittle. Unfortunately, many people are told to drink milk and eat dairy foods to avoid or alleviate osteoporosis, but the high protein content in milk more than offsets the calcium it provides, so that milk may actually lead to calcium loss. High levels of protein also are known to be linked to kidney disease, resulting from the extra strain of filtering waste during protein breakdown. Animal protein and fats are linked to immune system deficiencies. To help your body prevent and fight disease, from flu to cancer, your immune system should be at its most efficient. Avoiding foods high in fat and cholesterol, as most animal foods are, and getting regular aerobic exercise is the best prescription for good health. Some weight training is also helpful in preventing bone loss. An old myth that continues to circulate is that more protein is needed to gain greater strength and athletic performance. It has been repeatedly scientifically demonstrated this is not true. Excess protein is either excreted or, more commonly, converted to fat. Whether this extra protein is consumed in foods or in supplements, the body treats it in the same way. Claims that one supplement has amino acids and is more readily absorbed than others is a reflection on how little the public knows about the body's use of proteins. For persons wanting to gain weight, these supplements are probably beneficial, but that gain will be primarily fat, not muscle, unless a rigorous exercise program is followed. Exercise is what builds muscles. Supplements and energy foods are never directly turned into muscle. Many other claims have been made for various amino acids, from curing diseases to preventing insomnia. There has been no scientific evidence that over-the-counter amino acid supplements cure anything, but large doses of some have been linked to the development of some health problems, and the FDA has tried to stop sales of mega-doses of amino acids. The average American consumes over 100 grams of protein a day, more than three times the amount needed for optimum health and nutrition. For reversing heart disease you should limit your intake of protein to between ten and fifteen percent of calories. By eating a variety of vegetables, whole grains, legumes (beans, lentils, peas) and fruit you'll get all the protein you need.